Does 85 WPM impress you? The common short cuts are: Ctrl+X for Cut, Ctrl+C for Copy, and Ctrl+V for Paste. These are optimized for use on the left side of the keyboard. "Computer Keyboard Shortcuts for one hand typists. 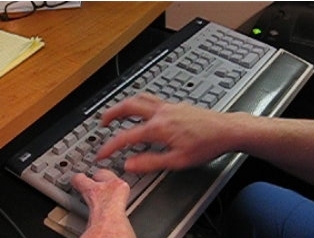 Resources for vocational, occupational, rehabilitation therapists, and their clients, who have lost full, or partial use of one hand, with a special emphasis on learning to type with a standard keyboard." "This video clip is of me, Lilly Walters. Note how I use my less able hand to do the SHIFT key. I am typing on a normal keyboard. I really do up to 85 words per minute - with enough caffeine and sleep. The keyboard shown here is a NORMAL keyboard you will find in any office, school or home. No alternative keyboard layouts. Just what all of my peers use. By the way, I type faster than most of my peers! All because I learned to type with one hand."